In the fall of 1994 at Rainbow Babies and Children’s Hospital in Cleveland, 10 infants from the eastern innercity area arrived with acute pulmonary hemorrhage, and Dr. Dorr G. Dearborn was the lead physician and investigator on the case. “We didn’t know what we were dealing with,” says Dr. Dearborn, who received his PhD in biochemistry and his MD from the University of Minnesota and worked as a researcher at the National Heart, Lung, and Blood Institute before joining the hospital and becoming the director of the cystic fibrosis laboratory at Case Western Reserve University. Dearborn quickly contacted the Centers for Disease Control and Prevention and, after six weeks and many home visits, made a stunning connection. Nearly all of the families lived in water-damaged homes that contained the black mold Stachybotrys chartarum, and the infants had inhaled the toxic spores, which investigators associated with the acute pulmonary hemorrhaging. With government assistance, the families were moved into new homes. 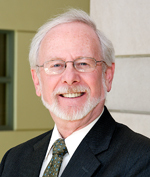 Dr. Dearborn began a research program supported by the National Institute of Environmental Health Sciences, the U.S. Environmental Protection Agency, and the U.S. Department of Housing and Urban Development (HUD) to study the effect of toxigenic mold on the lungs of infant animals and the impact of mold and moisture on the health of infants and young children. He helped to initiate a public awareness campaign with the HUD Office of Lead Hazard Control called the Healthy Homes Initiative (later adopted as part of that office’s formal title). The case earned Dr. Dearborn wide recognition and served as a catalyst for his research into residential air quality. With the HUD Office of Lead Hazard Control, Dr. Dearborn expanded his home visits with assessments and interventions for home triggers, including allergens and particulate matter. He recently demonstrated that this led to a 58 percent decrease in asthma hospitalizations following the visits. He’s also testified before Congress to raise awareness of the potential threats. Today, the 73-year-old continues his research and teaches as Mary Ann Swetland professor of environmental health sciences and chairman of the CWRU School of Medicine Department of Environmental Health Sciences. He’s also a professor of pediatrics in the Pediatric Pulmonary Division at the hospital. A little over ten years ago, he founded the Swetland Center for Environmental Health. “The charges of the center are to instill environmental concerns into undergraduate and graduate medical education, provide for an environmental clinic and a research laboratory, and to be a resource for the local health departments relative to environmental health,” Dr. Dearborn says. Through the center, Dr. Dearborn teaches fellows how to perform home visits to identify triggers that include toxigenic mold, particulates, deodorants, and gas from cooking stoves. They learn how to council families in correcting and preventing the hazards, and Dr. Chmiel has made this education mandatory for his fellows. “They use what they’ve learned in almost every patient after that,” Dr. Chmiel says. Dr. Dearborn’s investigations have expanded to include many interesting environments, including green housing. Last month, his consortium was awarded a $5.8 million, seven-year grant by the JPB, Kresge, and Wells Fargo foundations to investigate the health benefits of green renovations of inner-city apartment buildings in San Francisco, New York City, and Cleveland. Dr. Dearborn will be continuously monitoring the residential air quality (temperature, humidity, carbon monoxide, carbon dioxide, total volatile organic compounds, nitrogen dioxide, and PM10/PM2.5) with remote sensors that he and his team have developed for the National Institutes of Health CWRU National Children’s Study Center, a large longitudinal study that tracks children from conception to 21 years old to study the impact of the environment on the genetics of childhood health and development. He’s also extending the capability of monitoring residential air quality into the field of COPD. When not pondering indoor air, Dr. Dearborn enjoys fresh air while fly-fishing for five pound rainbow trout in Lake Erie tributaries, just 30 minutes from his home. He also enjoys spending time with his wife, Joyce, who recently retired after 34 years as the administrative director of the NIH-funded Dahms Clinical Research Unit at University Hospitals Case Medical Center, and five children and seven grandchildren from his first marriage.